Each day I’ve been to the beach this week, I look down to see CALICO SCALLOPS. Every shell bag that I peeked into… I saw CALICO SCALLOPS in every color of the rainbow. So I started picking them up too only to get obsessed by analyzing the amazing colors and patterns… then naming each one like every crayon in a box of Crayolas or those cute names they come up with for nail polish colors these days. Sanibel Sunburn. See? Haven’t you looked like this at least one time on Sanibel? Now this last one really got me tickled. It’s seems like this SCALLOP started out with lots of color power to keep up with the Joneses…. and the First Day Vacation Sunrises…. and the Summer Smoothies but decided just regular old plain was good enough for him (or her). So I couldn’t decide on a name. How about … Sleep Late. or Lazy Days. or I give up (No really, LOL the name “I give up”. or Uncle. Plain Yogurt? Maybe a touch of vanilla! Calicos are my MOST favorite shell in the world! I love all of these variations. I find a lot of purple ones and sometimes black ones on Canaveral National seashore where we like to go! Enjoy your summer! It’s hot here in FL….but I love it! How about Sanibel Sangria for the purplish one? It makes me think of an orange-flavored cupcake with white frosting (upside down in the picture!). I love making pendants from the colorful scallop shells! They are too pretty not to show off! Pizz- A Paradise! Love that one! It does look like a slice of pizza! When I was taking the photos, i thought of the same thing… a little book or calendar. I’ll work on it! WOW! What fantastic scallops! They are all gorgeous, but I think my favorites are Sanibel Sky and Captiva Creamsicle. Can’t wait till September – hope there are some shells then. Isn’t it funny how we all can come up with something these shell can remind us of…and they are all different! Sally T. said the last one could be called “Your Petticoat Is Showing” hahah. Clark thought the last one looked like a cowgirl’s ruffly skirt. Anna, I loooove your scallop pendants! That last one looks like a tequila sunrise! Pam, Great photos, imaginatively named scallops…What a joy to behold …All photographed by a true shell lover….Thank you!!! 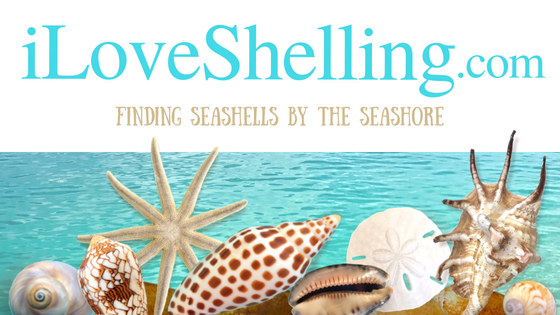 I love all the calico shells I have from Sanibel~! Naming them is fun, but harder than you think! Turned the shell around and call it Sanibel Sunrise! Love it! Yes, Linda, I think Candy Corn is perfect! I vote Candy Corn! The last shell reminds me of an “Orange madeleine” (cookie)…. orr… how about “Sunny side up” – kudos to Kim who mentioned first that it reminded her of an egg! “First day vacation sunrise” and the “I’m on island time” are my fav’s. Pam, Thanks so much for sharing these!!! I loved the watermelon scallop you posted the other day. Beautiful! I always think the conchs and the whelks and the olives are my favorites. But when I have them in a bowl my eyes always gravitate to the scallops. Love the pattens and variations and the colors. They have to be the prettiest shells in terms of eye candy. Love the names Pam – love, love the colors you have collected. Wowza! They are all magnificent…I particularly like “I’m On Island Time”. That last one also reminded me of a French Manicure…Sanibel Sunset French? Nah…other people are more clever than I. The Calico Scallops are sure pretty…it’s hard to pick a favorite. But I have to marvel at all the variety that one shell type has to offer…as do they all, yes? Kudos to all your imaginations! Yesh…keep ’em comin’! Yahoo! Love the colors of all the scallops but being from East Tennessee and being a huge Tennessee Vols fan. I love the orange ones. They remind me of the vols orange jerseys. So I vote for them to be the state shell of Tennessee. All joking aside those are the most colorful and beautiful of all the shells in my opinion. I enjoy picking them up when walking along the beaches and admiring all the colors and the patterns on the shells. Each one is unique in color and pattern and that is what I find most interesting. My choice for the name of the last shell pattern is probably the Orange Cupcake with Cream Cheese Frosting. Incredible color!!! Can’t pick just one fav but orange cream jumped right out at me (I wish). Keep up the great job everyone & keep those pics coming. See ya in October!! I collected so many beautiful scallop shells the first time I went to Sanibel, that I began a new tradition in my church. Every time someone is baptized, I invite them to take a scallop shell out of a basket full of them– because scallop shells are a symbol for baptism, and my church actually uses a big silver one to pour the water on the person. So, adult or baby, everyone gets a scallop when they are baptized. I see them all over the place– one member has his on a chain, hanging from his rear view mirror– another keeps it on the table by her prayer book– another keeps it on his bedside table. When I retired from that church, I left the basket of shells with them, and told them to call me if they ever need it replenished! Wow, they are all so beautiful, I have never seen so many different colors and designs on them. Simply beautiful ! Sanibel sun(set) chip dipped in a mustard/ketchup relish. The first thing I saw on the Cold Captiva Creamsicle shell was the shape of a gingerbread man. How about “Sanibel Smile” for the last one? The white part on the bottom looks like a row of teeth. Love it ! Everyone of them! Wow, there REALLY is a gingerbread man in “Cold Captiva Creamsicle”! Can’t believe I didn’t see it until I read Carol’s comment. I have my kitchen done in “gingerbread” and yet I missed it. Great imagination Carol! I favor the Sunnyside Up for the unnamed shell but there were several really good names. I’m never good at naming anything so won’t even try. I love these photos. I have some scallop shells but nothing nearly this colorful and nothing from Florida having (sadly) never been there. This is my first post but have been “captivated” by your web site for a few weeks now. Sanibel is my dream vacation. Wish I could say I’ll see you in October but I’m afraid not. Maybe one of these days. Keep up the good shelling and your fab website. I’m getting a glimmer of the entry you’ll be making in the special category of the Shell Show next March!! Great names! Keep ’em coming. How about Sanibel Sunrise for the un-named shell? These beauties are always my favorites – I’m addicted to picking them up. Can’t wait for November – our next trip down! Love the names, and all the scallop shell. I cannot resist scallops, no matter how many I have just keep getting more, love this posting. Pam, you clever girl! Don’t know how you can always come up with such delightfully entertaining bits … I totally love scallops and these are all so gorgeous and you gave them perfect names. I showed my husband and he thought the last one looks like a very smiley, “Toothy” kitty…just needs some eyes. Hmmmm, maybe “ToofyBelle? I have always loved the colorful scallops. Last week when we were on Sanibel we found two bright yellow. They were beautiful and I have not often seen them. My lovely wife and I just returned yesterday from a 33rd anniversary trip to Sanibel and loved seeing this report. We came back with way too many Calico’s but we just couldn’t help picking them up. I have never seen those violet shades on any of our Calico’s up here on the North Florida Gulf Coast. We also made a special point of looking for the ones with the orange stripes. Very cool! Thanks for highlighting one of my favorite “common” shells. Oooh, just love those calicos! The last shell should be named Eggs For Breakfast! AND each one is unique, just like you.